The joint should function normally or near normally within 3-6 months of surgery. Any arthritic changes present prior to surgery cannot be reversed and unfortunately, arthritic changes can progress very slowly in patients that have undergone surgery however without surgery this progression will be much faster. Often the injury that causes a ruptured cranial cruciate ligament will also result in tearing of one or both of the menisci. The menisci are pads, which act as shock absorbers within the knee. It is very important that the surgeon perform an arthrotomy (opening of the joint) at the time of surgery to examine the cartilages and repair any damage if necessary. An arthrotomy also allows debridement of the remnants of the cruciate ligament, which if left behind will accelerate arthritic change. If surgery is not done, we expect the unstable joint to develop significant arthritis. Although some dogs will stop limping almost completely after a month or so, the lameness may never resolve and is likely to steadily worsen over months to years. The leg will likely be permanently limited and always painful. When surgery is done, the knee is immediately stable, progression of arthritis is greatly slowed and in most cases good athletic use of the leg is regained. Pictured on the left is a dog’s knee one year post surgery. You can see that the bone has re-grown at the surgical site, and the screws, pins and plates are securely in place. A special note is appropriate concerning the dog’s weight. 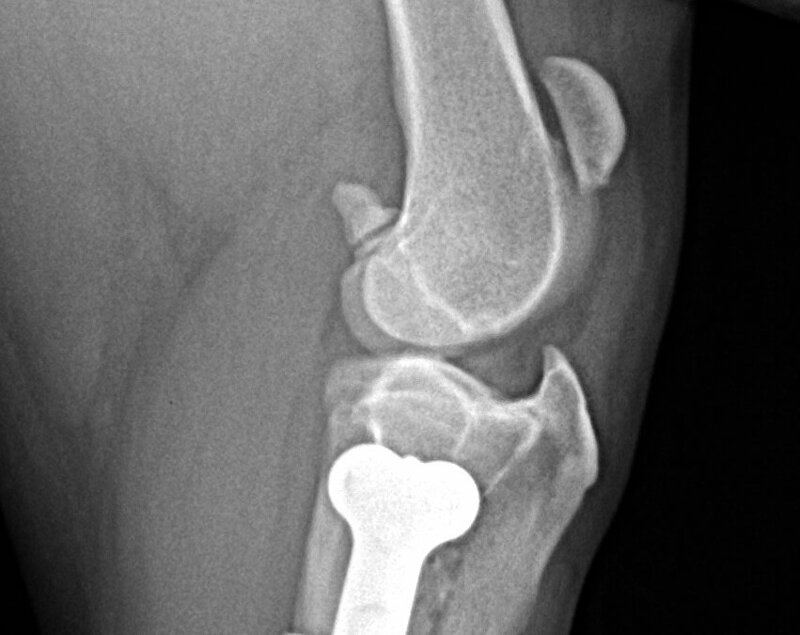 Obesity or excessive weight can be a strong contributing factor in cruciate rupture. The ligament may become weakened due to carrying too much weight; this causes it to tear easily. Obesity will make the recovery time much longer, and make the other knee very susceptible to cruciate rupture. Obesity will also hasten the progression and severity of arthritis if present. If your dog is overweight it is worth consulting your veterinary surgeon regarding the problem. Various weight reduction programs are available and will assist weight reduction. 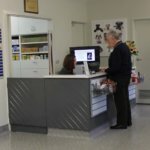 How long will my dog have to stay in hospital? Your dog will stay in hospital overnight after surgery. This is to ensure strict cage rest is enforced for the first 24 hours, and pain levels are adequately managed. Due to the amount of pain relief post surgical patients have in their system, combined with anaesthetic recovery, we find that they are quite content to rest in their cage and are rarely distressed by sleeping in hospital overnight. 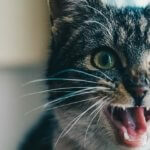 What do I expect when I pick up my pet from hospital? In most cases you can pick your dog up the day after surgery. This is normally around 24 hours after surgery is completed. You will be asked to call the hospital the day after surgery and our surgical team will let you know what time you can come and collect your dog. 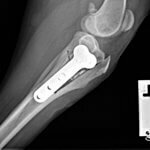 At the time of discharge, the vet will discuss with you the procedure, show you the pre and post surgical radiographs of your dog’s knee, and have a thorough discussion regarding aftercare. This will include a timeline of step-by-step rehabilitation tasks to be performed at home. It might sound overwhelming, but it involves tasks such as gradually increasing the duration of walks, gently bending the knee, and other things that are quite manageable to do at home, which are outlined in an easy to follow guide. We will also cover any take-home medications that are to be administered at home. This usually involves anti-inflammatories and pain relief. We will emphasize the importance of strict rest at home, and may advise you to purchase or hire a crate to keep your dog confined when not supervised, however some people can facilitate this at home using a small laundry or bathroom space. Your dog may have a bandage on its leg, and it will likely have an e-collar (plastic bucket) on its head to prevent any licking or chewing of the wound. Between 3-5 days after surgery we will ask you to bring your dog back to the clinic for a complimentary appointment with a nurse, so we can check the wound and ensure it is on the right track to healing. At this time we will also remove the transdermal pain relief patch (if applied) from your dog’s leg. We will then ask you to come back again 14 days after surgery for a follow up appointment with the surgical vet to assess wound healing, patient mobility, rehabilitation progress at home, and answer any questions you may have. At this stage we will likely start a series of 4 arthritis injections, which are given 1 week apart. 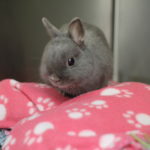 The first injection will be given at this vet review, then injections 2 and 3 with a nurse (no consultation fee), then the 4th injection given by a vet in the review. 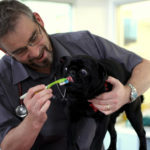 At the time of the 4th injection your dog will be about 5 weeks post surgery. You will see steady improvements in weight bearing, and you will be increasing the rehabilitation tasks following the rehab timeline provided. In month 2-3 you should see your dog moving their leg quite freely and taking longer walks. In the majority of cases, the joint should function near normally within 3-6 months of surgery. If arthritis had already set in prior to surgery, then there may be a permanent favoring of that limb. Repeat courses of the arthritis injections may be prescribed once or twice yearly. This series of blogs have been a brief overview of the cruciate ligament repair process from start to finish. At any stage before, during or after the process we are available to answer any questions or concerns you may have on 9878 3033. Remember, we are here to support you throughout the process to ensure the best possible outcome for your pet.